Open a command prompt as Adminstrator. Type Regsvr32 els.dll (if you get error code 0x80070005 then you didn’t run as Administrator). 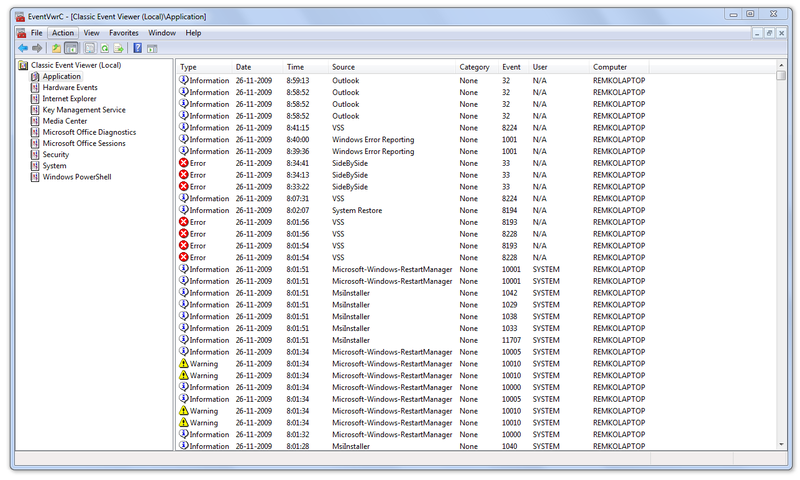 Start mmc.exe and goto File | Add/Remove Snapin. 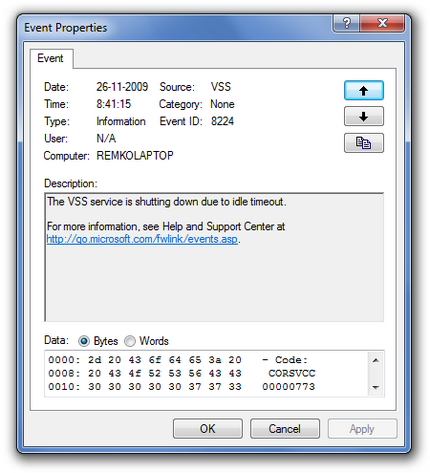 From the available Snapins choose “Classic Event Viewer”. Right-Click Classic Event Viewer under Console Root and select New Window from Here. Choose Customize from the View menu. Now save the file with a name of your choice eg EventVwrC.msc. Windows Vista introduced the Command Bar in Explorer which is sometimes also referred to as the Folder Band or the Task Band. 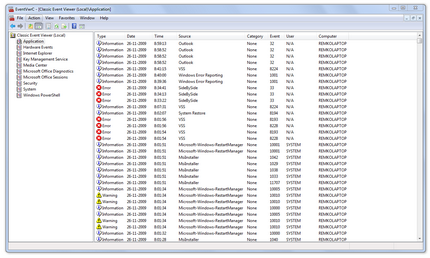 The Command Bar is of course also present in Windows 7 and Server 2008 (R2). This is more a note to self because I always forget. 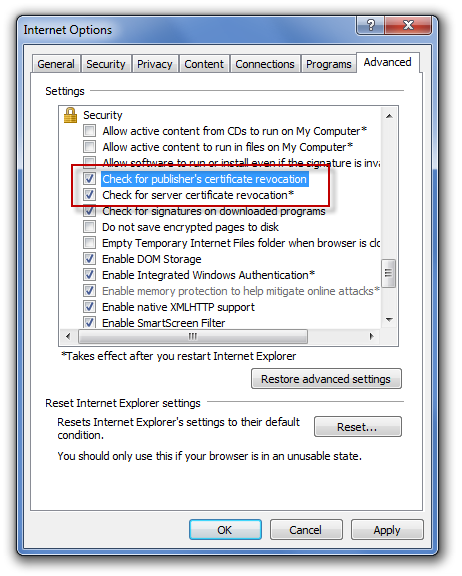 Explorer holds all it’s settings in memory so if you change a settings through the GUI (like in Folder Options) you cannot use a tool like Process Monitor to see what the corresponding registry entry is. I needed to add a printer connection to a Citrix server but the problem was that this printer had a buggy driver. I wanted to use an alternative driver such as the Citrx Universal Printer driver but on Terminal Server you might want to use the Terminal Services Easy Print driver. So I decided to make something that could be used in both situations, the result is a small commandline tool called AddPrinter2 (sorry I am not good in finding original names). AddPrinter2 “\\server\printer” “Citrix Universal Printer”. For a long time now people have asked for a version of LaunchRDP that includes the Connection Bar. The original version was originally written for a very specific purpose and I never anticipated so many people would want to use it. But it seems that a lot of people like the Connection Bar (I hate it, especially with sessions in sessions, so that’s why I am using RDPWithLocalTaskbar). It was clear that this wasn’t normal since the install job is taking installing OS components like IIS and all subcomponents, activating Application Server and reboot in around 9 minutes. The installation of Citrix XenApp itsself takes only 14 minutes. I searched with Google and one of the first links was this knowledge base article from Citrix: Slow Access Management Console Installation on XenApp 5.0. The article clearly describes that the delay is occurred by failing checks for Publisher’s and Server Certificate Revocation (because there’s no Internet Connection) and suggests to turn these checks off. Indeed my servers do not have a direct internet connection so the cause and solution were clear. And actually I had seen similar issues before in other (non Citrix) installations, some examples are Exchange 2007 (here and here) and SQL Server 2008 (the SQL Installer actually checks if there’s an internet connection in the prerequisites check). But since I had to do this on many servers I decided it would be better to do it with a little VBS script.